طیبی, سید مرتضی, قنبری, علیرضا. (1396). اثر یک جلسه تمرین مقاومتی برونگرا بر ویسکوزیته پلاسما، نیم‌رخ چربی و لیپوپروتئین پلاسمای دانشجویان پسر غیرفعال. پژوهش های فیزیولوژی و مدیریت در ورزش, 9(2), 157-168. سید مرتضی طیبی; علیرضا قنبری. "اثر یک جلسه تمرین مقاومتی برونگرا بر ویسکوزیته پلاسما، نیم‌رخ چربی و لیپوپروتئین پلاسمای دانشجویان پسر غیرفعال". پژوهش های فیزیولوژی و مدیریت در ورزش, 9, 2, 1396, 157-168. طیبی, سید مرتضی, قنبری, علیرضا. (1396). 'اثر یک جلسه تمرین مقاومتی برونگرا بر ویسکوزیته پلاسما، نیم‌رخ چربی و لیپوپروتئین پلاسمای دانشجویان پسر غیرفعال', پژوهش های فیزیولوژی و مدیریت در ورزش, 9(2), pp. 157-168. طیبی, سید مرتضی, قنبری, علیرضا. اثر یک جلسه تمرین مقاومتی برونگرا بر ویسکوزیته پلاسما، نیم‌رخ چربی و لیپوپروتئین پلاسمای دانشجویان پسر غیرفعال. پژوهش های فیزیولوژی و مدیریت در ورزش, 1396; 9(2): 157-168. تاثیر تمرین مقاومتی صرفا با انقباضات برونگرا با پیامد آسیب و التهاب عضلانی بر ویسکوزیته پلاسما کاملاً روشن نیست. هدف از تحقیق حاضر بررسی اثر یک جلسه تمرین مقاومتی برونگرا بر ویسکوزیته پلاسما، نیمرخ چربی و لیپوپروتئین پلاسمای دانشجویان پسر غیرفعال بود. تعداد 12 دانشجوی داوطلب غیرفعال به طور تصادفی انتخاب و به دو گروه تجربی و کنترل تقسیم شدند. گروه تجربی تمرین بازگشت کنترل شده (اکستنشن) از حرکت فلکشن آرنج را که دربردارنده یک انقباض برونگراست، اجرا کردند.­ زمانهای خونگیری به منظور اندازه گیری عوامل انعقادی شامل ­30 دقیقه پیش، بلافاصله، 2­و24ساعت پس از آزمون بود.اگرچه مقادیر لیپوپروتئین پرچگالی، لیپوپروتئین کم چگالی، تری­گلیسرید و کلسترول ­تام تغییرات معناداری نیافت؛ اما، ویسکوزیته پلاسما افزایش معنی‌داری در پاسخ به تمرین و کاهش معناداری در دوره ریکاوری یافت شد(047/0 = p)؛مقادیرحجم پلاسماکاهش معنی‌داری در پاسخ به تمرین و افزایش معناداری در دوره ریکاوری داشت(007/0 = p). اگرچه نتایج نامناسبی (کاهش حجم پلاسما و افزایش چسبندگی پلاسما) در اثر تمرین مقاومتی حاد و شدید برونگرا یافت شد، اما طی 2 الی 24 ساعت دوره ریکاوری، تغییرات کاملاً برعکس شده و ویسکوزیته پلاسما، در اثر افزایش حجم پلاسما به سطحی بالاتر از سطح اولیه، به زیر مقادیر پایه بازگشت کرد. به عبارت دیگر پاسخ بدن برای مقابله با اثر حاد تمرینیک حالت فراجبرانی بود. The effect of resistance training merely with eccentric contractions which are the result of muscle damage and inflammation on plasma viscosity is not entirely clear. The aim of the present study was to investigate the effect of one session of eccentric resistance exercise on plasma viscosity, lipid profile and plasmalipoprotein of inactive male students.12 male inactive students volunteered to participate in this study who were randomly selected and divided into experimental and control groups. Experimental group performed a controlled return exercise(extension) from elbow flexion movementwhich included an eccentric contraction. Blood samples werecollected 30 min. before, immediately, 2 and 24 hours after the exercise to measure coagulation factors. Although high density lipoprotein, low density lipoprotein, triglycerides and total cholesterol didnot change significantly, plasma viscosity significantly increased in response to the exercise and significantly decreased during recovery (P=0.047).The plasma volume significantly decreased in response to the exercise and significantly increased during recovery (P=0.007). Although inappropriate results (decreased plasma volume and increased plasma viscosity) were observed because of acute eccentric resistance exercise, the alterations were totally reversed after 2-24 hours of recovery and the plasma viscosity returned under the baseline as the plasma volume elevated to the level above the baseline. In other words, there was a supercompensation body response against the acute effect ofthe exercise. Blake, G. J., & Ridker, P. M. (2001). Novel clinical markers of vascular wall inflammation. Circ Res, 89(9), 763-771. Dill, D. B., & Costill, D. L. (1974). Calculation of percentage changes in volumes of blood, plasma, and red cells in dehydration.Journal of Applied Physiology, 37(2), 247-248. El-Sayed, M. S., El-Sayed Ali, Z., & Ahmadizad, S. (2004). Exercise and training effects on blood haemostasis in health and disease: an update. Sports Medicine, 34(3), 181-200. Eterovic, D., Pintaric, I., Tocilj, J., & Reiner, Z. (1995). Determinants of plasma viscosity in primary hyperlipoproteinemias. Clinical hemorheology, 6(15), 841-850. Executive Summary of The Third Report of The National Cholesterol Education Program (NCEP) Expert Panel on Detection, Evaluation, And Treatment of High Blood Cholesterol In Adults (Adult Treatment Panel III). (2001). Jama, 285(19), 2486-2497. Friedewald, W. T., Levy, R. I., & Fredrickson, D. S. (1972). Estimation of the concentration of low-density lipoprotein cholesterol in plasma, without use of the preparative ultracentrifuge. Clin Chem, 18(6), 499-502. Ghanbari-Niaki, A., Behzad Khameslo, M., & Tayebi, S. M. (2013). Effect of Pyramidal Training on Plasma Lipid Profileand Fibrinogen, and Blood Viscosity of Untrained Young Men. Annals of Applied Sport Science, 1(3), 47-56. 10.Ghanbari-Niaki, A., Tayebi, S. M., Ghorbanalizadeh, F., Ghaziani , & Hakimi, J. (2005). Effect of a single Session of Weight-Circuit Exercise on Hematological changes of Physical education Students. J Sports Sci, 1(2), 77-88 [Article in Farsi]. 11.Ghanbari, A. L., Tayebi, S. M., & Delrouz, H. (2011). The effect of a single session eccentric resistance exercise on some blood coagulation factors of inactive male students. Sci J Iran Blood Transfus Organ, 8(3), 195-206 [Article in Farsi]. 12.Hazar, S. (2010). The effect of regular moderate exercise on muscle damage and inflammation at individuals of different cardiovascular risk groups. Scientific Researchand Essays, 5(10), 1172-1180. 14.Hokanson, J. E., & Austin, M. A. (1996). Plasma triglyceride level is a risk factor for cardiovascular disease independent of high-density lipoprotein cholesterol level: a meta-analysis of population-based prospective studies. J Cardiovasc Risk, 3(2), 213-219. 15.Jamurtas, A. Z., & Fatouros, I. G. (2012). Eccentric Exercise, Muscle Damage and Oxidative Stress: INTECH Open Access Publisher. 16.Kaneider, N. C., Mosheimer, B., Günther, A., Feistritzer, C., & Wiedermann, C. J. (2010). Enhancement of fibrinogen-triggered pro-coagulant activation of monocytes in vitro by matrix metalloproteinase-9. Thrombosis Journal, 8(1), 2. 17.Kashef, M., Zare Karizak, S., & Shabaninia, M. (2014). Effect of One-Session Anaerobic Exhaustive Exercise on Lipid Profile of Active and Inactive Individuals. Quarterly of Horizon of Medical Sciences, 20(3), 171-177 [Article in Farsi]. 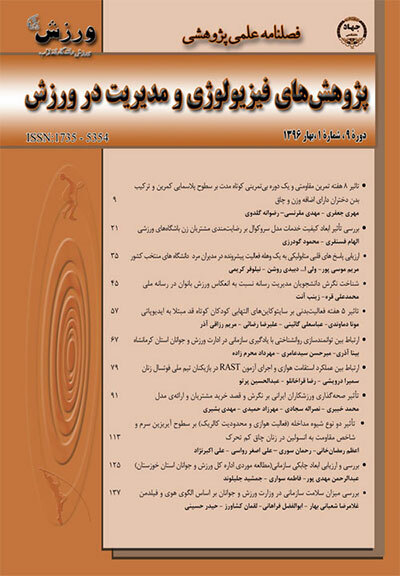 23.Rezaee, M., Soleimani, M., Hasanshahi, M., Ebrahimi, F., & Ebrahimi, M. (2014). Comparison effect of three methods of resistance, endurance and concurrent exercises on coagulation markers and serum lipid Profile of non-athlete male collage students. InternationalJournal of Sport Studies, 4(7), 848-854. 25.Tayebi, M., Agha Alinejad, H., Kiadaliri, K., & Ghorbanalizadeh Ghaziani, F. (2011). Assessment of CBC in physical activity and sport: a brief review. Sci J Iran Blood Transfus Organ, 7(4), 249-265 [Article in Farsi]. 26.Thompson, P. D., Crouse, S. F., Goodpaster, B., Kelley, D., Moyna, N., & Pescatello, L. (2001). The acute versus the chronic response to exercise. Med Sci Sports Exerc, 33(6 Suppl), S438-445; discussion S452-433.